This course provides an overview of and an introduction to the fundamentals of aeronautics, using the history of aviation as a story line. The course uses examples from the very beginning of aviation (the Montgolfier brothers’ balloon flight in 1783 and the Wright brothers’ heavier-than-air flight in 1903) and continues all the way through to the current Airbus A380 and future aircraft. This trajectory will start with a general introduction to aeronautics, to be followed by a closer look at aerodynamics and flight performance. Lectures are frequently accompanied by related exercises and demonstrations. The course also incorporates (design) challenges/competitions, based on the knowledge obtained through the lectures. 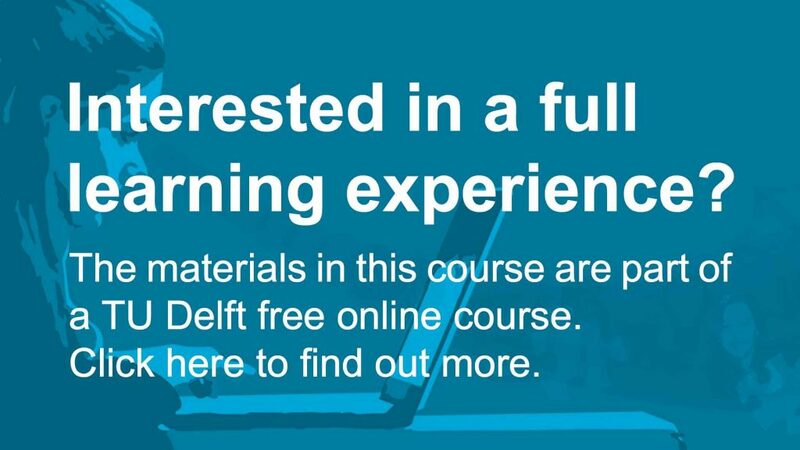 The course materials used in this MOOC are available on TU Delft OpenCourseWare and can be viewed and downloaded for free. If you enrol for the MOOC, you will be introduced to up to date techniques in web lectures and webinars. Also you will apply each technique to a case with fellow learners. Ultimately, the combination of these techniques provides a coherent analysis of the problem. If you want to enrol, go to https://online-learning.tudelft.nl/courses/introduction-aeronautical-engineering/ to learn when the next run will start. Introduction to Aeronautical Engineering by TU Delft OpenCourseWare is licensed under a Creative Commons Attribution-NonCommercial-ShareAlike 4.0 International License. Based on a work at https://ocw.tudelft.nl/courses/introduction-aeronautical-engineering/.